Cut steak into 2 1/2 inch strips going across the grain. Add all the ingredients to pressure cooker. Cook for one hour at medium pressure. Shut of and wait until the pressure has reduced and you can open the cooker safely. Shred the beef and place it back into the cooker. With the top off the cooker, cook for another 20 minutes. 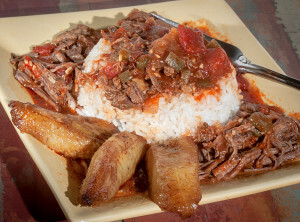 Remove from cooker and serve with white rice and sweet plantains. Note: If you do not have a pressure cooker, you may cook it on the stove top in a dutch oven or large pot. Replace the one hour of cooking time in the pressure cooker by four hours at low to medium-low heat on the stove top.